The Vélodrome de Saint-Quentin-en-Yvelines is a velodrome in Montigny-le-Bretonneux, France. 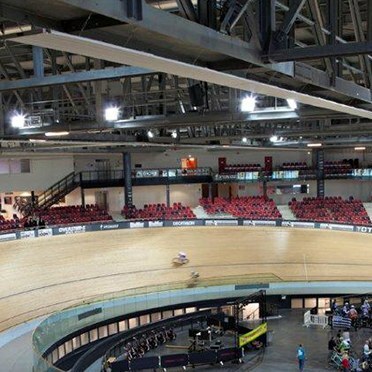 Home to the French Cycling Federation, it was opened in 2014 and boasts an Olympic standard track which hosts the 2015 UCI Track Cycling World Championships. At 3 000m², the central track area is fully modular and customisable. Measuring 250 meters long and 8 meters wide, it is the only one in the world with such dimensions. The velodrome can accommodate up to 2 700 people for all types of events. Thorn was commissioned by returning customers Bouygues + SNEE to provide the track lighting based on an existing successful partnership with Thorn and the combination of the proposed solution and associated cost. There were two key lighting objectives for this state-of-the-art velodrome. Firstly, to provide the required illuminance with the best colour ambience and secondly, to ensure lighting makes the velodrome a welcoming home to the UCI Track Cycling World Championships. To meet competition and broadcasting standards, the required illuminance levels included 1 400 lux vertical illuminance to be maintained in the direction of the main camera, 4 000 lux vertical illuminance for the finish line, and 2 700 lux overall horizontal illuminance. 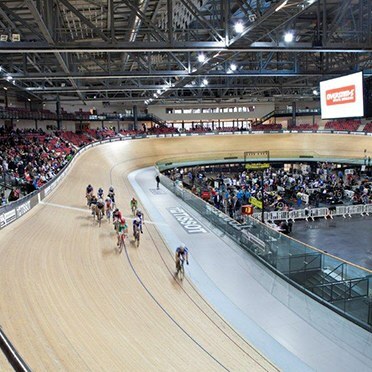 Thorn’s Mundial 1KW floodlight was chosen for the velodrome. Mundial is a high power, high performance floodlight designed for all sport applications and large area illumination. In the case of main supply failure, Thorn’s PRT floodlights have also been installed to enable an instant restart. The parquet track’s high gloss protective film made the aiming of the floodlights in a way that would avoid reflection and glare in the direction of the cameras particularly challenging. Compared to the 2KW version however, the Mundial 1KW floodlight met all of required luminance levels while providing less glare to ensure comfort for spectators. What’s more, by using a greater number of smaller floodlights (260 in total), the track’s unique curves and dimensions are better illuminated. A mix of intensive and extensive optics and two switching levels have been used in order to adapt the lighting to the architecture and the different surfaces to be lit.